Fewer, shorter, and smaller outages. 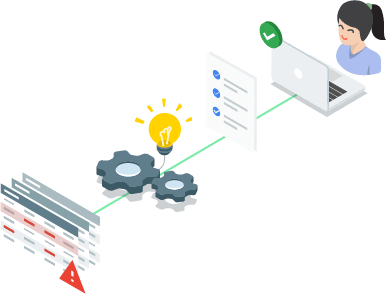 Stackdriver Incident Response and Management (IRM) provides end-to-end incident lifecycle management that incorporates battle-tested response processes and data-driven intelligence to reduce median time to mitigation. IRM leverages Stackdriver’s breadth, depth, and freshness of ops data to auto-correlate information, in the context of the incident, to produce insights and accelerate the investigation process. IRM codifies Google SRE incident response best practices, so users achieve the key SRE journey milestone of a process to manage production incidents. When paired with Stackdriver Alerting, you don’t need to configure IRM to get started. Intelligent analysis of your Stackdriver ops data to quickly identify high-value information related to incidents. Machine learning will provide insights tuned to your environment, especially as your environment changes over time. Easy constructs to quickly capture key incident response activities and decisions for later contextual presentation in IRM to improve median time to mitigation. For Stackdriver alerts, immediately review a chart of the violating metric, alert details, deep links to more ops data, and similar incidents — past or present — to quickly understand the extent of the alert and determine next steps. Use Google SRE incident response roles (Incident Commander, Ops Lead, etc.) to command and control incidents and ensure there are no gaps or overlaps in the response. Shift-handoff system to better facilitate the transfer of context between on-call shifts. Immediately leverage Stackdriver Alerting’s Slack configurations to indicate an incident’s primary communication channel and subscribe Slack channels to incident updates. Increase the awareness of large-scoped incidents among your team for better response coordination. Use IRM’s presets to expedite the process by pre-specifying summary templates, links to playbooks and other information, tags, and the stakeholders and external teams to keep informed. The Incident API (alpha) provides extensibility to IRM’s UI for custom ChatOps plugins to update and track incidents from Slack and other chat tools. Complete this form to be whitelisted for the API alpha. While in alpha, use of IRM is currently available at no charge. There are no costs or quotas associated with using its features.